Last night, a long and extraordinary life came to an end. 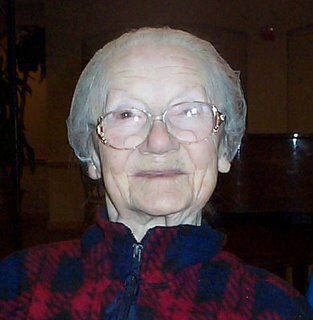 My grandmother died quietly at the age of 103. I’m sad but in a way I’m happy for her. I’m glad that her fiery, energetic spirit is no longer trapped in a frail, helpless body. I belong to a school of Buddhism that was founded in this country by a Korean monk named Zen Master Seung Sahn. It was said that, during his final illness, he commented that our bodies were just rental cars and that is was time for him to trade his in. After a slow decline that encompassed not just years but decades, Grandma finally got to trade hers in last night. I hope her next one is a nice, shiny sports car. i like that britt comment. agreed. grandma will be missed for sure- i'm super glad you can find hope and goodness in her passing. whatever comes when we move on from the world, i bet her candy and barettes and pedicures are around when she needs them. love to you and mom. My sympathy to you and your mom, Big Nephew, Little Nephew, and the rest of the house. I'm sorry for your loss, and glad that she's at peace. I'm sorry, Lucy. The loss of the physical matters more than we expect, but you sounds like you have it in balance. I'm so sorry for your loss, Lucy. I enjoyed your earlier blog post about her. It sounds like she was an amazing woman. I'm sure that the next couple weeks are going to be emotional, hectic, and exhausting. If you need anything at all, including shop-sitting, running errands, etc., let me know. My schedule is very flexible. You all are so wonderfully kind. My family and I thank you for your kind thoughts. Hugs to you during your mourning and condolences to your family.